The Nathaniel B. Palmer (“Big Yellow”), the research vessel that researcher Meghan Spoth will be calling home for 10 weeks. Photo by Meghan Spoth. Meghan Spoth is a first-year master’s student at the University of Maine studying how climate change affects glaciers today and how glaciers have changed in the past. She is going into the field to study Thwaites Glacier in Antarctica then Mt Usborne on East Falkland Island. First, she will take a plane to Santiago, Chile then to Punta Arenas, Chile. 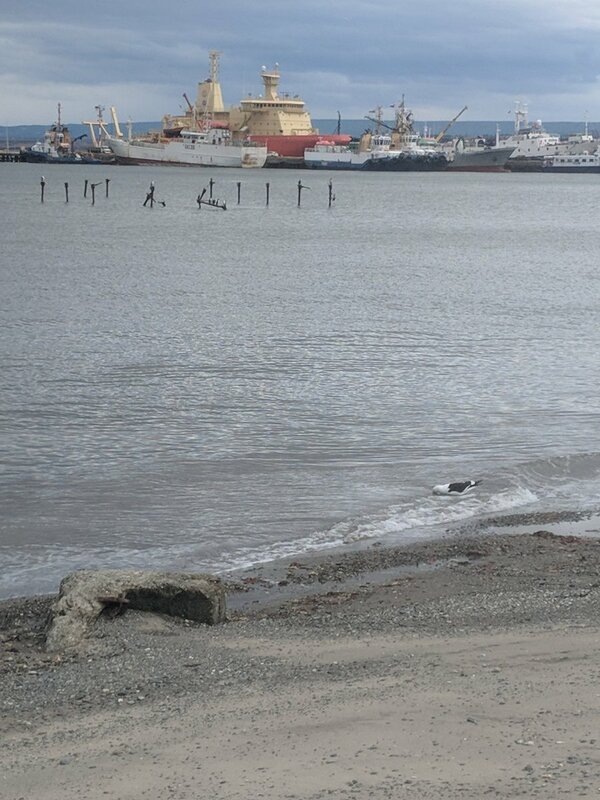 From Punta Arenas board the RVIB Nathaniel B. Palmer research boat she will call home for 10 weeks. She is a research assistant working alongside scientist from the United States and Great Britain studying how warmer temperatures are affecting the glacier and the local wildlife. Some of the projects are: collecting seal and penguin bones to date seashores, using seals to record deep-sea water temperature, using radar to map the ice and rock beneath the ice, and taking cores of sediment sample from the bottom of the ocean. 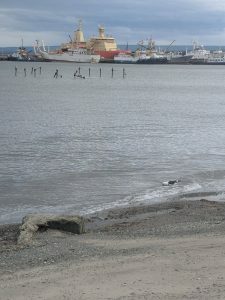 After getting off the boat, she will take a plane from Punta Arenas to the Falkland Islands for her thesis project. Her goal is to determine how the climate has changed over the past 10,000 years. Meghan and her advisor will be traveling with a guide to the top of Mt Usborne with ATVs to bring all their supplies to basecamp. At the field site, they will take a boat to the center of each pond to use a giant piston gun to shoot into the lake bottom to collect a sediment core. Then, they will ID the local plants to use the sediment core to determine how this region has changed. Meghan is excited to answer your questions and share photos of my expedition! You can join the expedition right here through this Follow a Researcher® Extra!